The 1983 born and 1.75 m tall football sensation is a high profile sportsperson from valley. Hailing from Srinagar, Ishfaq Ahmed plays as a winger (attacking midfielder in a wide position) in the game. He is playing for the national Mohammedan Sports Club, Kolkata at the moment. His first pay cheque was Rs 4,000 a month. It came in 1998-99 when he played for J&K Bank. Gradually, as his playing skills created sensation around, his income also surged. And, today Ahmed’s net income in a calendar year has been said to be around Rs 2 to 2.5 crore! The turning point in his career arrived when he was selected for J&K under-21 football team as the captain. He emerged as the best player of the tournament and won Man of the Tournament Award. And soon, scores of offers from various clubs poured in. He joined Hindustan Aeronautics Limited (HAL). His stint with the club earned him lot of accolades. As the good performance persisted, he got offer from Dempo Sports Club, Goa where he played for 4 consecutive seasons. During the same time, the then manager of the Indian national team (2002-2005), Stephen Constantine selected him in the India national side for the Olympic qualifying matches. 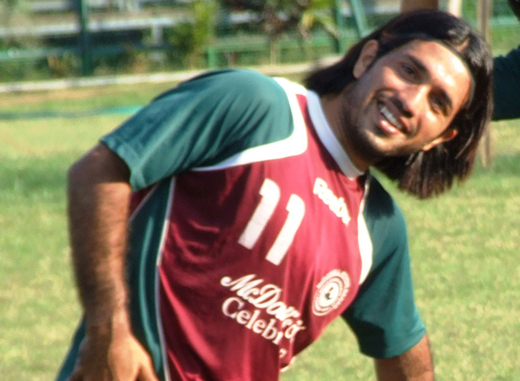 By June 2007, Ahmed had joined Mohun Bagan AC. During his first season with the club, he was the most consistent left-sided midfielder. During the 2007-08 season, he appeared in 37 matches where his performance was highly praised. But despite the ‘excellent’ season, he was not called up for the Indian national squad. He signed with I-League champions Salgaocar SC in June 2011. And the next year, Ahmed was signed for East Bengal from Salgaocar for the 2012-13 season. He was a regular member of the East Bengal team that finished third in the I-League. It was Ahmed, who played an instrumental role in team’s winning streak. 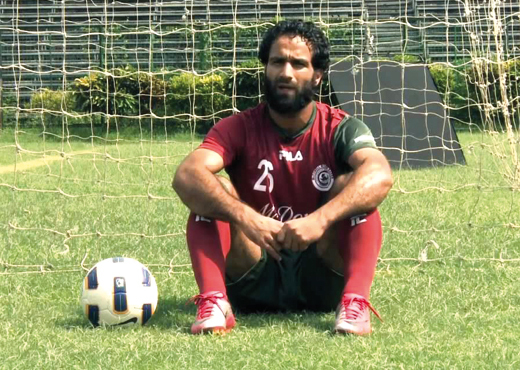 After the 2012-13 season ended, Ahmed signed with IMG-Reliance to join their Indian Super League. But due to objection from the I-League clubs in which they said they would not sign any players who joined the ISL, it meant that Ahmed would be without a club for a long period of time. Then, on October 30, 2013, it was announced that Mohammedan Sports Club had broken that barrier when they signed Ahmed on loan. He first made news during 2009 Cricket League T20 when he was detained by Bangalore police. He was charged in connection with a suspected presence of “traces of explosives in his bag”. He objected to the checking of his bag by sniffer dogs at his hotel room. After questioning, the police learnt that he objected due to the holy Quran and a prayer mat in his bag. The young Parvaiz Rasool had come to Bangalore as part of the J&K under-22 team playing in the CK Nayudu Trophy. He was later released by the police after a few hours as no incriminating evidence was found against him. Five years down the road, the Bijbehara boy has created a niche for himself in cricketing arena with both bat and ball. He made to the level where others before him had failed to reach. And today, the off-spinning all-rounder is not just any other cricket buff from the valley. He is the new poster boy for cricket enthusiasts’ in Kashmir. His excellent playing numbers have also surged his income graph. And presently, his net worth is said to be around Rs 1.5 crore. The figure includes his match fee in Ranji Trophy (which is around Rs 40, 000), earnings made by brand endorsements, IPL and other promotional activities. Rasool, who was a standout performer for Jammu and Kashmir in the 2012-13 Ranji Trophy, ended the season as its top scorer and highest wicket-taker. In his seven Ranji matches, Rasool scored 594 runs at an average of 54 runs per match with two centuries. He also took 33 wickets at an average of 18.09 – to finish, as the third-highest wicket-taker among spinners in the tournament. His good show with bat and ball in Ranji season ensured him a berth at the national level. And, soon he was picked for the India A side to play against England in a one-day practice match in Delhi. But he made his mark when he picked up 7 for 45 for the Board President’s XI against the visiting Australians in their tour-opener in Chennai in February 2013. The IPL season-2013 was round the corner and he was signed by the Pune Warriors IPL franchise. He was also named in the India probables for the Champions Trophy. 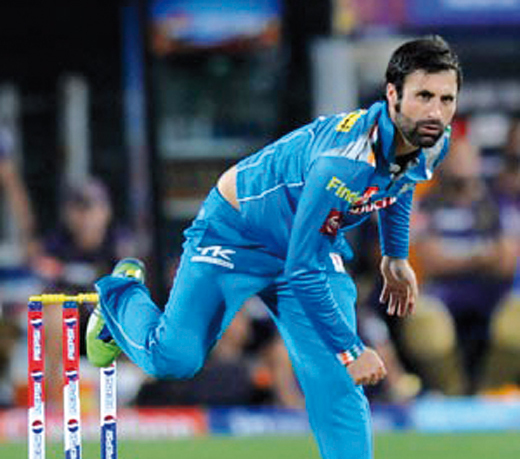 Rasool belongs to a family of cricketers from the town of Bijbehara in South Kashmir’s Islamabad district. He has represented the state right from the under-14 level. His elder brother Asif had played two T20s for J&K in 2009, while his father was a former opening batsman in his hometown. He became the first player to be selected for India A side who played against England in a warm-up match. Before him, Abid Nabi, Surendra Singh and Abdul Qayoom were picked for national-level squad, but they couldn’t make it to playing eleven. He got his maiden call-up for the national team in 2013 for the Zimbabwe tour. But he did not play a single match and warmed the benches throughout the tournament. Rasool’s success both on and off field has infused a new life in Kashmir’s cricket. The buzz is that if Rasool can, why can’t we! Motivated by his father Mohammad Sultan Wadoo, he started playing football at the age of 8. He is the poster boy of Jammu and Kashmir football. Wadoo, a 30-year-old Srinagar-born international football star, started his career with Iqbal Sports and moved on to play for J&K Police. It was while playing for J&K Police that Wadoo received his first pay cheque of Rs 5, 000. And since then, there was no looking back for him. “My passion for football never disappointed me,” says Wadoo. “Football has given me everything which I could dream of.” By terming his current earnings “something very personal,” Wadoo says football for him has been the “game-changer”. As per some estimate, Wadoo’s net worth is said to be around Rs 1. 5 crores per annum (though some say it is around Rs 2 crores). But before the big bucks poured in, Wadoo had to pass through the challenging times. He says, going was difficult for him because conditions weren’t conducive for football in the valley. It was the time when Kashmir did not exist on the football map. Besides, the ‘poor’ infrastructure in place was further adding to the woes. It had never happened before. And soon, Wadoo performed well and started to play for national clubs like HAL, ITI, Sporting Club de Goa, Mohun Bagan and East Bengal. Wadoo started his career as striker but played as defender for a long time. Now he plays as a midfielder in the Mohammedan Sporting Club and the Indian National team. In Dec 2005, he scored the winning goal against Bangladesh in the SAFF Cup Finals at Karachi. He was a member of the Indian squad that won Nehru Cup 2007, the AFC Challenge Cup 2008 and the Nehru Cup in 2009. For more than a decade now, Wadoo has been the torchbearer for state’s footballers at national and international level. He has played football in around 35 countries which include some of the top European football destinations. Recently, he helped his club Mohammedan Sporting Club to lift Indian Football Association (IFA) Shield trophy after 43 years. He needs no introduction. A 28-year-old Kashmiri pandit from Srinagar’s Rainawari locality, Suresh Raina has created a name for himself in international cricket. An attacking left-handed middle-order batsman, Raina has played for Uttar Pradesh in all forms of domestic cricket and is the vice-captain of Chennai Super Kings in the Indian Premier League. Son of a retired military officer, Triloki Chand, his family migrated to Ghaziabad in Uttar Pradesh in the 1980s. Today, his net worth has been calculated as US $167000000 (` 10.31 crores) in a calendar year, to be precise. He is a Grade A category player in Indian team which fetches him Rs 1 crore per annum as contract fee alone. The other players in that category are MS Dhoni, Virat Kohli and R Ashwin. He became the captain of the Uttar Pradesh (under-16) in 2002 at the age of 15 and a half year. In late 2003, he toured Pakistan for the under-19 Asian ODI Championship before being selected for the 2004 U-19 World Cup, where he scored three half centuries, including a 90 scored off only 38 balls. He was selected to participate in the Challenger Series in early 2005. But the big break came only after Sachin Tendulkar was healing an injury and Captain Sourav Ganguly was out of the squad on suspension. 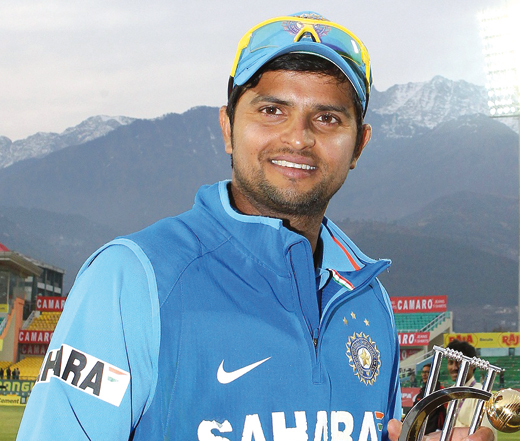 Raina was selected for the Indian Oil Cup 2005 played in Sri Lanka. Raina was signed by the Chennai Super Kings for US$ 5 million for the first three years of the tournament. He played a vital Man of the Match performance in the last league fixture to give Chennai Super Kings the win they required to qualify for the semi-finals. Ultimately the Super Kings finished as the runners-up of the league with Raina scoring 421 runs for his team. 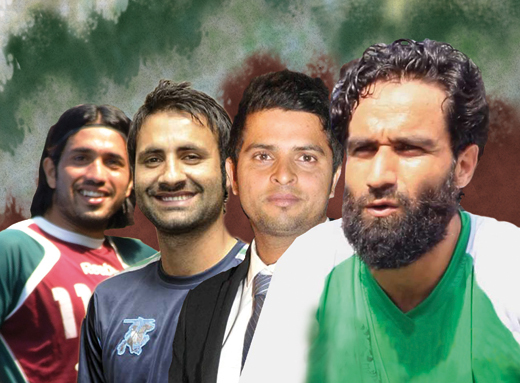 Going by the feat achieved by these four sportspersons of valley, sports as a career apparently scores over the rest!